Ya Jagoff!!! | It's Labor Day.. That Telethon Thingy Is On! Home Blog Updates It’s Labor Day.. That Telethon Thingy Is On! And we hope that you are all enjoying the extended weekend. We took today off from writing about Jagoffs to give you a quick update on the blog and what there is to look forward to in the near future. The blog reads continue to grow. We appreciate that!! Feel free to continue inviting others. We love a crowd. The proceeds of our “Don’t Be A Jagoff” t-shirts still go to Magee Women’s Research Institute Foundation for Breast and Ovarian Cancer Research.. So encourage your friends to go purchase one please. This past July we received Pittsburgh Magazine’s Best Blog recognition. That was COOl.. ok… COOLER than COOL…like sitting on a block of ice in 5-year old undies!!! We started this blog posting ever Monday, Wednesday and Friday. We now post five days a week… it keeps us DAMN busy… but it is fun! We have videotaped a demo web series with local comedians talking about Jagoffs….the rough cuts look pretty good. We hope to release those within the next month. We are also in the process of videotaping a number of “Interesting Pittsburghers” interviews. So far we have “TC” the whistling beer vendor at local events, Scott Harbaugh of WPXI, Scott Blasey of The Clarks, local artist Christopher Nix and we are now working on a couple of others. Feel free to send us who YOU would like to see interviewed. We will be looking for local breast cancer survivors to shoot some video with for October, Breast Cancer Awareness Month. If you are interested or know of anyone interested in telling their story to encourage others. 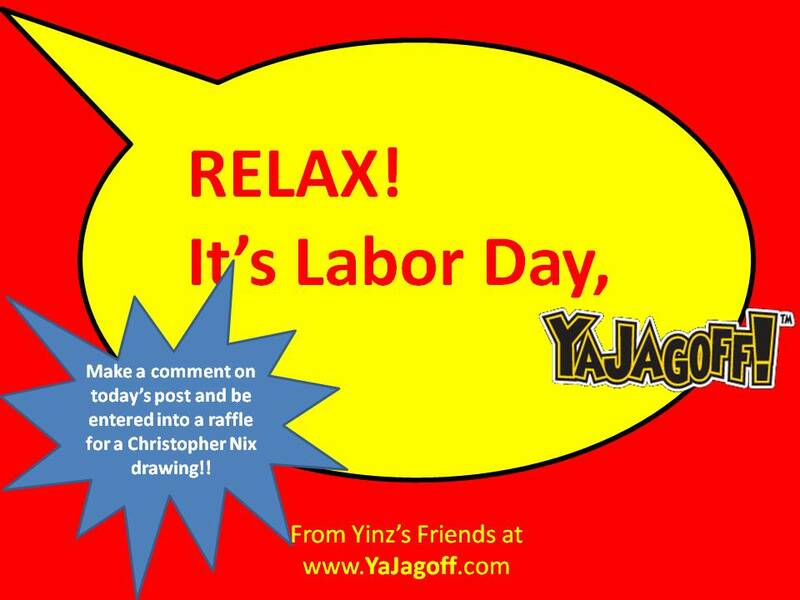 Let us know ASAP…(yajagoff at comcast dot net). To be honest, we didn’t really take today off. We are in a Labor Day parade. Well, not really IN a parade… we made our own parade. We went to Giant Eagle and purchased a bunch of 10-year old hard candy and tootsie rolls and are simply driving around the area today throwing the candy out at little kids. Of course, since we THINK we are in a parade, we’re driving as slow as a senior citizen headed to McD’s during rush-hour for their chit-chat with his buddies and that bottomless cup of coffee. Previous articleChicken-Fight Served FAMILY STYLE! Hey, its fixing to rain. So what are yinz doing getting out the grill? yajagoff LOL. Yeah… exactly.. wonder if there will be a news story of people who tried to grill inside…. could be a great post for us!! I love the idea of YOUR parade!! Yinz are some of the coolest non-jagoffs I know. So glad to see you moving forward… not only helping fight breast cancer, but letting more people see what a jagoff is so they can work hard not to be one! With everything you guys do and give for breast cancer I’m proud to say that Ya Jagoff is the best Burgh blog out there. Thanks for doing everything you do, at least I don’t have to worry about yinz guys being Jagoffs. Thanks Rob!!! really appreciate it! Love the blog, and would love to be a part of it. Cool…would be great to have you write a guest blog!!! somethin’ about hockey jagoffs if ya want.. or whatever..
Classic Pittsburgher to interview – Sheree Goldstein – founder and owner of The Square Cafe, local volunteer and generally outstanding person. Thanks.. will check into her..
Haaa.. be careful no to bean any kids in the forhead.. lol.. thanks so much for being a new followers.. we TRY to be funny.. hopefully you will agree..
Haaaaa… oh man.. Don’t know how close we would want to sit to him for an interview.. but it would be good one..
imagined a grown man in a pair of child’s Spider-Man underpants, sitting and shivering on a big block of ice…? Keep up the great work, Ya Jagoff! haaaa… now THAT’s funny… although we meant how thin the material would be after 5 yeras.. lol…headed out to get some spidey undies now! How did I not know about this blog!? I’m dying laughing here! Haaa. We do too. Dashboard cam guy went MIA. Thanks so much Carla… appreciate it. If you run out of Tootsie Rolls, just pull over to a nice, well kept park area or grassy median. You will find plenty of little “tootsie rolls” left behind by people who don’t clean up after their dogs…..THE JAGOFF’S!!!! Yinz are simply the best! SOO look forward to your posts in this far away land I live in.Nawh go have some coffee and think of me!